Mediafootprint » What is Your SWOT? The SWOT analysis is a very valuable tool to use for your business needs. If you know your strengths, weaknesses, opportunities and threats, you will have a better insight into the potential and critical issues affecting your business. It can help your business discover what your competitors do better. It can also focus on making the most of the resources and opportunities available. 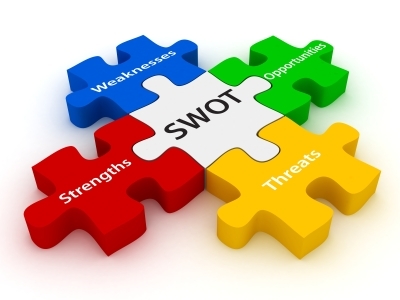 SWOT is an acronym that stands for strengths, weaknesses, opportunities and threats. The strengths and weaknesses are internal to the business and relate to the present situation. These include company culture and image, organizational structure, key staff, operational efficiency and capacity, brand awareness, market share and financial resources. The opportunities and threats are external to the business and relates to the changes in the environment that will make an impact. These include customers, competitors, market trends, supplies, social changes, new technology, and economic, political and regulatory environments. The key challenge is to match strengths with opportunities and convert weaknesses into strengths. The result of the analysis is a matrix of positive and negative factors to address. S – Strengths: These are internal strengths. Some questions that can apply are: What advantages does your organization have? What is your company’s unique selling points or propositions? What do you do better than your competition? What do you do well? W – Weaknesses: These are internal weaknesses. Some questions that can apply are: What are the factors that lose sales and business? What should you avoid? What do your customers see your company as a perceive weakness? Where do you lack resources? What do you need (sales, marketing, etc)? O – Opportunities: These are opportunities in the external environment. Some questions that can apply are: What changes in technology and markets can improve your business? What changes in social patterns and lifestyle can be used? What are the economic trends that can benefit your company? What are the new needs you can meet for your customers? What are the emerging political and social opportunities? T – Threats: These are threats in the external environment. Some questions that can apply are: Do you have negative cash flow or bad debt issues? What are the obstacles you face? What are your competitors doing? Where are you most vulnerable? What are the negative political and social trends? A SWOT analysis is a simple and useful tool to focus on your strengths, improve your weaknesses, minimize threats and take the advantage of opportunities.